The smart car finally came to North America after what seemed like an eternity, having already sold more than 770,000 first generation (1998-2006) vehicles in 36 countries globally. smart is a member of Mercedes-Benz Cars. 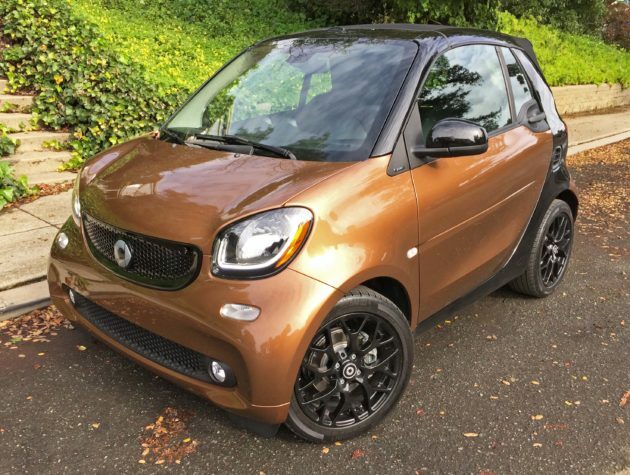 The U.S. became the 37th country to offer the smart for sale, with the U.S. version designed specifically for two people, and called smart fortwo, which has now grown to 46 countries. The diminutive vehicle is made in France and is truly of Lilliputian proportions. It was only 8.8 feet long, 5.1 feet high, with an equal measurement in width. It tips the scales at 1,852 pounds in the heaviest model. smart fortwo originally came in two levels of trim: Pure; and Passion. Both trims were available in two configurations: Coupe and Cabriolet. The latter featuring a fully automatic. Two-position convertible soft top with heated glass rear window that receded and closed electrically at speeds up to 60 mph. The smart fortwo is most commonly referred to as “cute”, though I normally avoid describing any vehicle as such. There are those who irreverently refer to it as a “clown car”, while suggesting wearing large red bulb noses when onboard. smart fortwo displays a futuristic Jetson-like stying, and despite its reduced dimensions, is surprisingly big on interior space along with comfort and features. It is definitive proof that good things really can come in small packages. The first impression registers as sporty as well as cute. The innovative two-material construction concept consists of a tridion safety-cell crafted from high-strength steel and colorful, interchangeable body panels made of premium, dent resistant plastic. Projection headlamps with indicators incorporated into them adds to the little car’s futuristic look. The front, which appears as if it might house the engine, does not. Nor does it provide trunk space. Storage for one’s personal gear is behind the seats. All rear-wheel drive smart fortwo models, except the electric drive version, were originally powered by a 1.0-liter, transversely-rear-mounted motor that connected to a five-speed automated manual transmission ahead of the engine. The motor generated 70 horsepower and 68 pound feet of torque, and was capable of propelling the car to an electronically limited top speed of 90 mph, or from 0-60 mph in 12.8 seconds. It’s not a dragster folks. I’ve driven all examples of the smart fortwo – Coupe and Cabriolet, gasoline and electric-powered. My latest test vehicle was a smart fortwo pure coupe, powered by a 0.9-liter (999 cc) DOHC, 12-valve, turbocharged inline three-cylinder engine with electronic fuel injection coupled to a six -speed automated dual clutch manual, single gear transmission with steering wheel mounted paddle shifters. The new engine produces 89 horsepower at 5,800 rpm along with 100 pound feet of torque at 4,500 rpm. Its exterior was sprayed in Deep Gloss Black, with the interior done in black as well. The base price was set at $14,650., while the final total came to $19,830. after adding for the optional: 6-speed automated dual clutch transmission; P11 Prime equipment group; Sport package with Sport suspension, 16-inch alloy wheels and paddle shifters, and the Destination charge. Each trim level adds progressively more features and equipment. SUMMARY: The smart fortwo has a lot of things going for it – it is visually appealing to most observers, it’s economical (with an EPA estimated 34 mpg city and 39 mpg highway), it’s fun to drive, and it fits easily into minimal parking spaces (two will fit into a conventional parking space). Acceleration is not blistering, and while the earlier automated manual transmissions took some getting used to, being similar to BMW’s SMG gearbox, with a bothersome lag between gear changes. The new 6-speed version automatic is much smoother, with no negative issues. At maximum freeway speed, crosswinds can present cause for concern due to the car’s squared profile and short wheelbase. The interior space and amenities are surprisingly plentiful and user friendly, and the ride quality is compliant enough, but potholes should be avoided when possible. The handling characteristics are responsive and positive. Parking, though requiring less space as mentioned earlier, requires closer attention, because the exterior planes are difficult to judge, lacking outward reference points. Safety concerns are generally a major consideration given the size and construction, but after viewing several crash and roll-over test footage, smart fortwo came through the displayed tests with flying colors, bolstering enough confidence to entertain purchasing one personally. Kudos for the playful, futuristic appearance and appeal and the surprising amount of functional interior space. The gasoline powered smart fortwo in pure coupe configuration is less than half the price of the electric drive version, making gas the logical choice. The 2016 smart fortwo is now longer, has a wider track, but with a reduced turning circle (22.8 ft from curb to curb and 24 ft from wall to wall), and is driven by a smaller engine that produces more power and torque, and it’s faster. 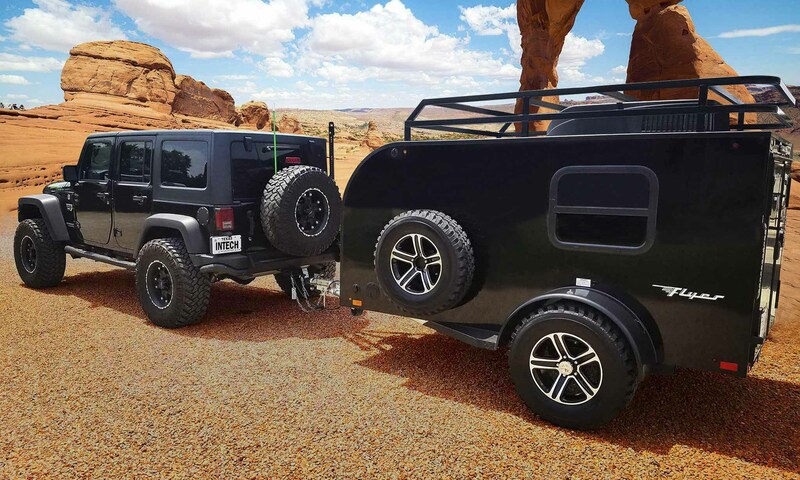 Design-wise, there’s a new pronounced shoulder line and the twin section tailgate is a highly popular feature. In the final analysis, the smart fortwo delivers on fun, practicality, fun, economy and once inside, one forgets how petite it really is, as it feels exceptionally roomy., not to mention more comfortable than earlier examples. Oh, and it’s quite versatile and FUN-ctional. Transmission: Six-speed twinamic automated dual clutch manual, single gear. Drive Train: Transversely-mounted rear engine / Rear-wheel drive. Suspension: Front – MacPherson coil spring strut with stabilizer bar. Rear – Dedion with coil springs. Brakes: Hydraulic dual circuit Front disc/rear drum with tandem servo assist, ABS, traction control, ESP and Hill Start Assist. Tires: Continental ContiPro Contact 185/50 R16 81H M&S front / 205/45 R16 86H M&S rear, mounted on four joined “Y”-spoke black painted alloy wheels. 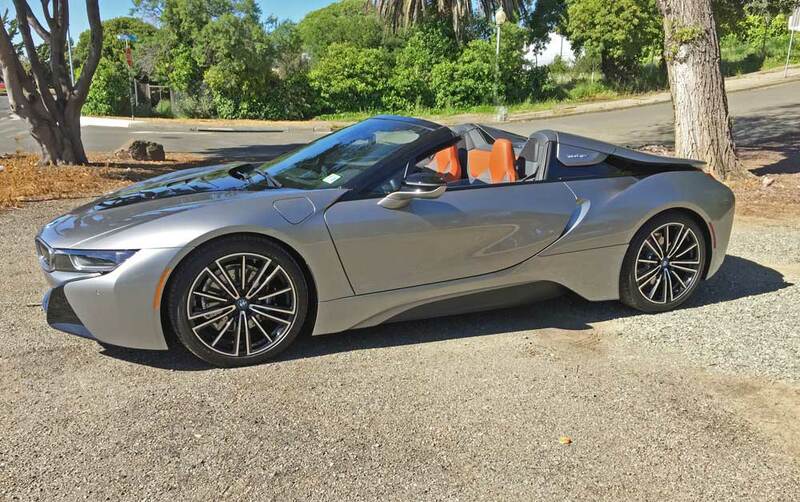 0 – 60 mph: 12.8	seconds / Top speed now 96 rather than 90 mph.